Perhaps one of the most recognized and iconic running brands of all time, New Balance is over 109 years old and since the company’s inception all the way back in 1906, they have been continuously developing and refining their line to remaining firmly at the pinnacle of footwear design. Their rich heritage, technologically advanced designs and co-signs from some of the worlds greatest athletes has seen the brand gain notoriety worldwide for their performance line. More recent times have seen their form fitting styles make the seamless transition into the lifestyle market aided by the retro runner resurgence, of which New Balance have played a huge part. 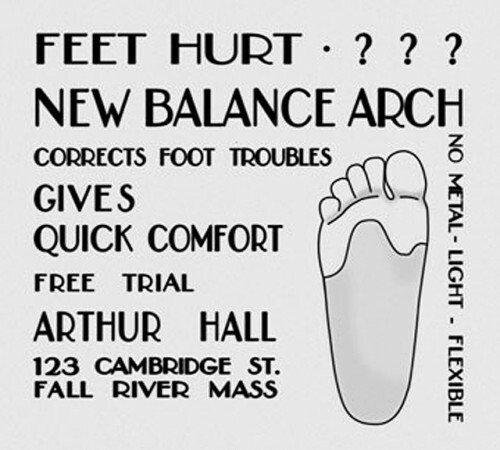 British emigrant William J. Riley founded the New Balance arch support company back in 1906, manufacturing arch supports and other accessories to aid foot support and improve shoe fit. Hailing from Boston, Massachusetts, the brands name ‘New Balance’ is believed to be derived from and inspired by chickens, having observed the way chickens move and describing their three-clawed foot as providing the perfect balance. Riley’s products fit and feel were better than any other support on the market at the time, and aided by the chicken foot that he kept on his desk, would sell to the customer based by their needs and circumstances. The companies focus on providing foot support continued through to the 30’s. Having hired a man named Arthur Hall to be a salesmen in 1927, Hall went on to become a business partner of Riley in 1934, and would find his niche marketing the products by targeting those who had jobs that would require them to be on their feet for prolonged time. In 1938, designed by Riley, New Balance released their first ever running shoe, kicking off a legacy that still continues to this day. The lightweight kangaroo leather, crepe-soled shoe was designed for the Boston Running Club known as the Brown bag Harriers of Belmont, Massachusets. Word got around and the success of their innaugral shoe release spread quickly, spurring the developing their footwear line. By 1941, New Balance was creating custom made shoes for athletes in running, baseball, basketball, tennis and boxing. Despite the success in these markets, arch support and prescription footwear remained the cornerstone of New Balance operations. In 1954, Arthur Hall sold the business to his daughter and son-in-law – Eleanor and Paul Kidd. Under the Kidd’s guidance, the company would continue to develop and in 1961 a new era for the company began when they manufactured the game changing ‘Trackster’. The Trackster was the worlds first performance runner, constructed with a ripple sole and available in multiple widths, it gave runners comfort, stability and grip like never seen before. The shoe quickly gained popularity from college running teams and got a big boost through YMCA fitness programs across the nation. The brands reputation grew as word spread of its innovative performance footwear and its game changing multiple widths design through word of mouth and grass roots promotion. Ownership of the company changed hands once again when in 1972 New Balance’s current chairman Jim Davis bought the company from the Kidd’s on the day of the Boston Marathon. At this point the company employed 6 people pushing out 30 pairs of shoes a day, with most of the sales coming through mail orders with US based retailers. Jim Davis committed to upholding the current and founding values of the company, with fit, performance and manufacturing key to New Balance’s success and their willingness to work to individual preferences, provide high levels of customer service and quality a huge part of the company’s history. In 1975 Tom Fleming won the New York Marathon wearing a pair of New Balance 320’s, which would go on to be rated the number one running shoe in the market and was the first shoe to bear New Balance’s now iconic ‘N’ logo. A huge stepping stone for the company that would act as a launch pad for New Balance on a global scene. As Boston became the centre of the 1970’s running boom, Anne Davis, wife of Jim Davis, joined the company. In 1978, her aim was to focus on building a distinct culture for New Balance employees and its customers. The 70’s brought notable progress for the company in its design, alongside the 320 which combined stability, forefoot cushioning and width sizing, 1978 saw the release of the W320 making the shoe available for women. The end of the 70’s delivered another innovative introduction when in 1979 the CT300 was born, offering a GUM rubber outsole within a polyurethane core offered for the first time. New Balance continued to prosper into the 80’s as Jim and Anna Davis looked to expand the company abroad. 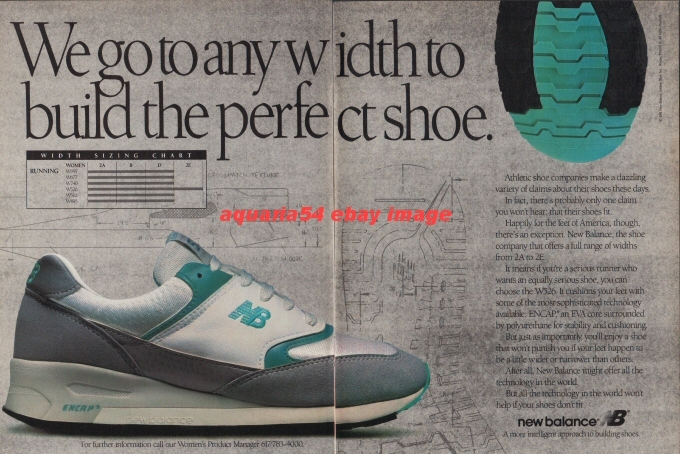 An integral part of their development was moving into new sport markets, and the 80’s brought New Balance’s first ever basketball shoe, the 428 which was adopted by Boston Celtics star M.I Carr. 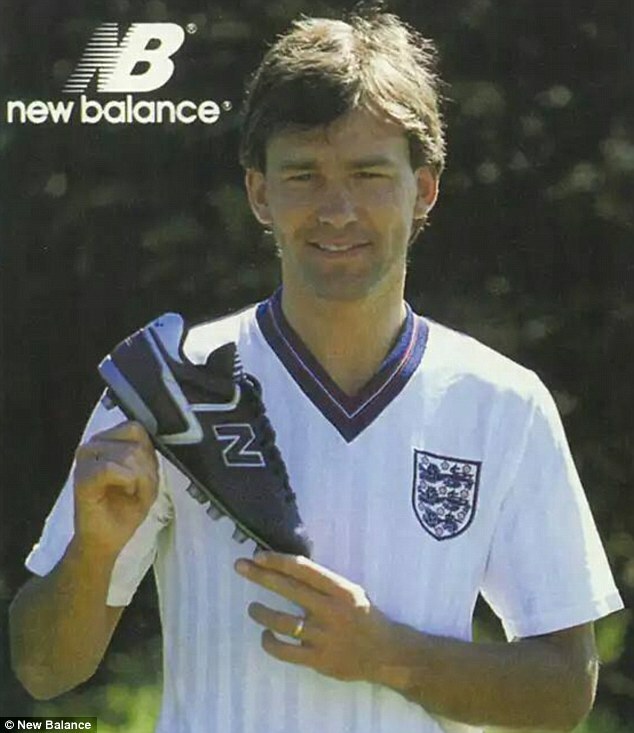 The company also moved into Aerobics with the Jamboree silhouette and in 1984, following two years of design collaboration, they introduced the first ever football boot with the legendary Bryan Robson. Alongside design developments which brought about the likes of the multi terrain 565 with its hounds tooth outer sole, the iconic 990 Made in the USA footwear series was born, as well as staple styles such as the 576 and 577 runners. These silhouettes would go one to play a huge role in the brands resurgence of late. Aside from a series of technological advances in their footwear designs, the 90’s brought a lot of success for team New Balance that would continue into the 00’s. 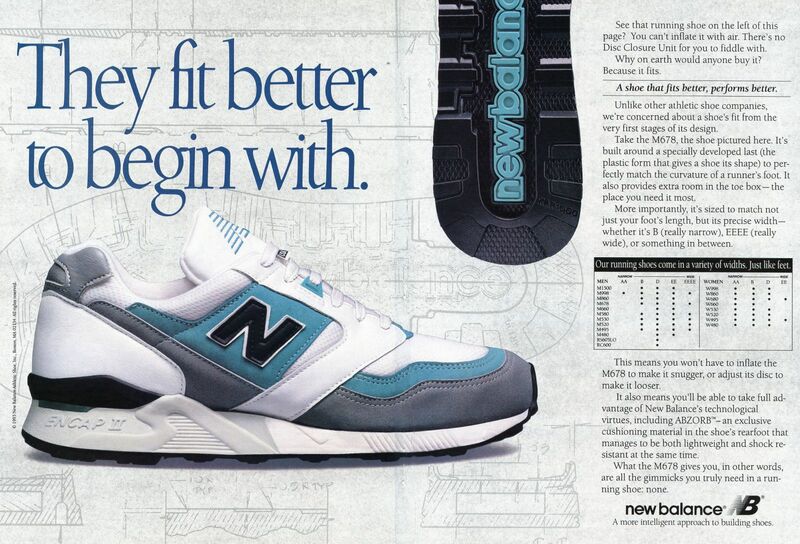 In 1994, perhaps the most significant design advancement for New Balance so far was the introduction of the New Balance suspension system that gave balance cushioning, support, shock absorption and motion control, offering the wearer a far superior ride. Team New balance continue their dominance through to the 00’s, snatching gold and silver at several events including the Boston, New York and London marathons. As well as opening a global research in their home state, the company continued to be at the forefront of innovation with performance apparel releases, 3D printed spike plates and new responsive cushioning system technologies. Again, moving into new markets plays a huge part of their development and recent times saw them produce professional products for cricket, skateboarding, with the launch of New Balance Numeric, and more recently launching New Balance football. Today New Balance are still one of the most sought after performance footwear manufacturers, as well as a leading trainer brands in the lifestyle market with its iconic ‘N’ logo found on the feet of famous fashion icons and sneaker lovers alike. They continue to re-issue some of their classic styles and introduce new innovative silhouettes all with consideration, quality and functionality in mind. 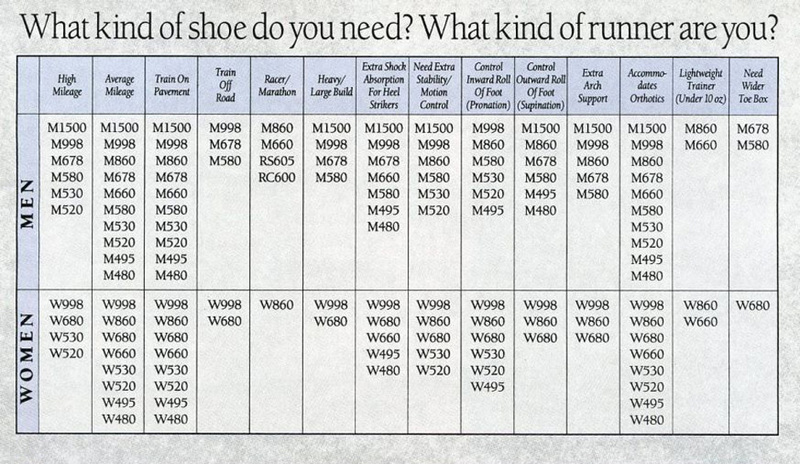 A huge part of New Balance’s philosophy is to provide for individual needs of its customer, with different uses for different shoes, each pair and its wearer should be considered unique and this is what New Balance’s numbering system aims to do. The system was originally introduced based on the companies pricing structure, and has become a significant way to classify and distinguish between each style. Most New Balance styles feature a 6-7 digit code which can be broken down into 3 separate parts. If we take our M1500MG silhouette for example. The first part of the code, the M, signifies the gender and the purpose for which the shoe was designed, in this case M stands for Mens. The second part, the 1500, is the model number which helps you distinguish between each style and also helps you shop a certain series, with the ’15’ indicating performance level and the ’00’ referencing the series. The final part of the model number, the MG, represents the colour way which in this case is Mint Green.